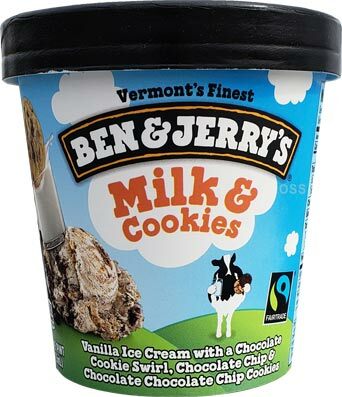 [2018 Update] When someone asks me what my favorite Ben & Jerry's flavor, well, this is it, but I hadn't actually bought a pint in forever. So, I did, and you know what? Even slightly freezer burned, this pint was still amazing. Original review after the break. [Original 2010 Review] I don't usually start my blog entries off with a bold claim, but let me say this: I'm pretty sure that today, March 13, I have most certainly tried what will go as one of the best new flavors of 2010. Ben & Jerry set the bar amazingly high on this one and they cleared it, oh my have they cleared it. Why am I ranting? Because I'm using what energy I have left to fight off the immense urge to go polish off what's left of this tasty pint of newness. Behold fellow ice cream fanatics, Milk & Cookies from Ben & Jerry [known as Clever Cookies in Europe]. To be honest, I wasn't really thrilled with the name at first, I guess I was just too tired for it to sink in --- Milk & Cookies --- Cookies & Milk --- Cookies & Cream! Ahhh, there it is! This, my friends, is the most unique take on Cookies & Cream that I have ever sampled. Here is the new flavor in all it's frozen glory! We have Vanilla Ice Cream with a Chocolate Cookie Swirl, Chocolatey Chips & Chocolate Chocolate Chip Cookies. That's right, **TWO** kinds of cookie dough in this awesome ice cream! 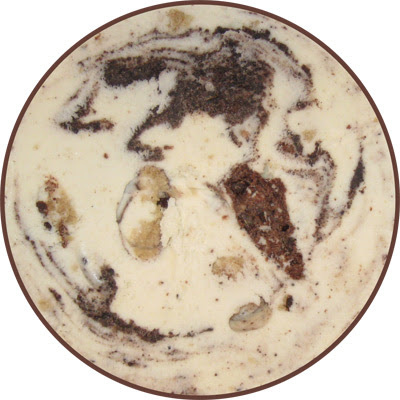 The dark brown spots are the chocolate cookie swirl. The straight brown spot in the middle there is the chocolate chocolate chip cookie dough, and then all those tan spots are the chocolatey chip cookie dough bites. I love a flavor that looks awesome right off the bat! I don't know if you can make them out clearly, but the cookie dough has these awesome little chocolate chips in them and they actually look like tiny chocolate chips (hmmm, probably should have put it next to something for scale). They are very small but definitely tasty and a very nice touch. Have I mentioned how hard it is not to go finish off the container right now? Every now and then B&J come out with an amazing flavor that I can't get enough of and this is one of those flavors. Simple fantastic. For perspective, let me start from the beginning (even though you know the conclusion). At first, I was thrown off by the name. Should I expect milk flavor? or maybe a mellow milk vibe to the whole thing? Then I read the description, and then I read it again. Two kinds of cookie dough? This I have to try, but then it sinks in and that little bar in your head just starts going up and up and up. Will this be the best flavor ever? Will this rule time and space with a fair and just demeanor for all? Will I run out of pointless things to say? I started to worry a little bit. What if it's boring and bland? What if all those cookie dough bits go to waste? There was only one thing to do, start eating! At first I was greeted by what can best be described as an awesome cookies and cream flavor. The top notch cookie swirl mixed with B&J's excellent vanilla come together to make a wonderful cookies and cream flavor. I love c&c so I was already happy, but then it was time to dig into the cookie dough bits. Wow, those are some top notch bits! I expect the best from B&J and they deliver on these bits. The right texture, the right taste, just plain right on the money. I settle in and really start to enjoy the ice cream. I expected the cookie dough bits to rule the roost here, but it started a little bit slower than that for me. At first they were just accenting the cookies and cream vibe. As I had more and more, as I really started to get into the bits everywhere, a wonderful flavor came over me. What's the problem with regular cookie dough? There's never enough cookie dough! Milk & Cookies has solved this problem in a most unique way. By starting with an excellent cookies and cream base, the cookie dough vibe never has to end. It's almost as if the ice cream and cookie vibe are in a near perfect one to one harmony. Once you realize this, once you are in the groove, you just want to eat and eat and eat and...... It's the pleasure of eating ice cream and the pleasure of eating a fresh cold chunk of cookie dough at the same time. Maybe I'm delirious on some kind of cookie dough high, but right now, at this moment, at this point in my blogging career, I adore this flavor. It is probably the best cookies and cream flavor I have ever tasted (or may ever taste). Now, go do yourself a favor: When you go to pick up a fresh pint of this stuff, save a trip to the store and buy two, you're gonna need it. 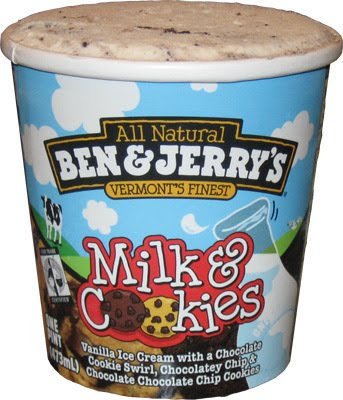 Note: This is also know as Ben & Jerry's Clever Cookies in some countries. I totally agree with you. It's my new favorite. I heard they were bringing back Gingersnap, haven't seen it yet, but I can't wait to try that one. Thanks for reviewing this! It sounds like everything I hoped for. A cookies and cream/cookie dough hybrid that may dethrone the original B&J cookie dough. Doh! I came sooo close to getting this flavor - but opted for Mud Pie instead because it sounded so different. And it is pretty good! Have to hurry and finish so I can get some Milk & Cookies!! Yup. That settles it. This flavor, along with oh ... 5 others (no I'm not obsessed with Ice Cream Pints AT ALL), is sitting in the freezer waiting to be eaten. I was contemplating which one to try first, but no more. It'll be this one. You make it sound so good. And I blush to admit that aside from initially reading the description of this flavor, the fact that it was a mixture of cookies and cream and cookie dough didn't sink in. And I'd been craving cookies and cream for a while. Woot Woot! I almost bought this when I saw it the other day but the name kind of threw me off and I decided wait. After reading your rave review I will definitely pick some up next time. What did you think of it, Hettar? Let us know! I had to post just to say that this flavor is indeed amazing. Probably the best new flavor I've tried in years. So addictive. Hey Dubba! My name is Katie, I'm the digital marketing person @ Ben & Jerry's - love your blog! What perfect timing, I'm sending ChunkMail (email) on Monday that features Milk & Cookies. And we're going to link to this post! Thanks for the great review! Where are you guys finding this flavor? I live in OKC, OK and can't find it in the flavor locator. HELP!!! I really want to try this! Just got linked up through B&J's Chunk Mail. Congrats! However, I must say that I'm disappointed that out of 34 different B&J varieties, there is not one for Chubby Hubby? Are you kidding me? That stuff is pure GODHEAD! Oh man, I can't wait to try it! Cookies and cream is one of my favorite flavors. I agree that the Milk & cookies name doesn't let the flavor tastiness sink in (or even "sync" in, lol). but if anyone can make a perfect cookies & cream, Ben & Jerry can!!! ok...its so nice to see im not alone! I Anastasia am a Ben and Jerry addict, i go to my local Ben and jerrys and buy Vanilla carmel fudge by the CASE! (yea..i did say case). I am considering starting a 12 step program for people like myself , however im really not even near ready to quit!you made the new flavor sound so amazing I cant wait to go get it! thanks so much!!! Okay, now I can't wait to try this new flavor!! Will there be a frozen Yogurt version of this coming soon ya think? I have to admit I will choose this for my free scoop tomorrow. Having said that, what has become of Wavy Gravy? I'm sorry but it remains my "best in show" when I get into a conversation about Ben and Jerry. I will never understand how any of the other flavors have had a greater longevity and/or B&J haven't tried to have it around as an extra more often. As I recall, it made the pick of the litter when all the flavors were compared to each other. Ugh. I gave up ice cream for Lent.... it's truly my weakness. I hope the Easter Bunny puts some of this in my basket this year! :) Less than 2 weeks until Easter! enough is enough! haven't we had enough of "cookies n cream" and "cookie dough" ice creams already? and now more of the same with "milk and cookies"? come on america, we need something different! When I got my chunk mail mentioning this new flavor about 3 weeks ago, I went straight to my scoop shop and tried it ... and then went straight to the market and bought 4 pints! I polished off the pints in less than a week and I'm tempted to restock - it's so delicious!!! The perfect ratio of vanilla and chewy chocolate cookie chunks/dough. Definitely my fav. flavor of the year! Their other new flavors, Mud Pie and Boston Cream Pie, are also pretty good, but can't match up to Milk & Cookies. You have to try this! Welcome everybody! I'm glad so many people are enjoying this new flavor (and my apologies for the typos = syncs instead of sinks). I still remember when B&J's Chocolate Chip Cookie Dough flavor first appeared on the supermarket shelf. It was like a bolt from the blue! Consider the kind of imagination that can envision the combination of smooth vanilla ice cream and lumps of not fudge, not nuts, not even cookies - but RAW cookie dough. Sheer perverse genius, I tells ya! Only a true fatty - err, ahhh, ice cream lover - can think like this. Everyone knows, the best thing about baking cookies is scraping the raw dough out of the bowl and snarfing it down! This new flavor is simply additional evidence. Ben and Jerry are Ice Cream Gods! I saw this in the store and I was the same as you and thought nothing really about it and got the peanut butter/chocolate one instead. But now I am going to go and try this new flavor, hope my son doesn't eat it all this time LOL Thanks for the tip on this one! When I was introduced to the pleasure of B & J'c Cookie Dough, the scoop shop in Cambridge shared space with David's cookies, a fresh cookie oasis in the land of Entemanns. They mixed left over dough into Vanilla and it was Nirvana. Ambrosia. Nectar of the Gods. Then David's disappeared and B and J s cookie dough became largely indistinguishable from half a dozen other premium brands. This sounds quite good though, and I look forward to trying it and if my taste buds catch even a hint of the old school Cookie Dough, I will be a happy camper. On the subject of retired flavors, I still acutely miss Dave Matthew's Band One Sweet Whirled: Mocha ice cream, caramel and marshmallow swirls, and espresso chocolate chips. Chubby Hubby is great, but how about a special one month edition of malted chocolate (extra malt, too) Chubby Hubby? This is probably the most epic flavor of ice cream ever. Taking two classics- cookies and cream, and cookie dough and uniting them into one powerhouse flavor? Yeah. Amazing. The bad? Way too easy to polish of a pint in one sitting. You keep referring to chunks of cookie dough - but the description clearly states chocolate chip and chocolate chocolate chip cookies. I would not expect dough at all. This reminds me of long ago, Steve's Ice Cream when they had prepackaged pints - they had a flavor called Monster Cookie which was cookies and cream with chocolate chip cookies in addition to the oreos. They also threw in some chocolate chips. Yes, This is not cookie dough! It is cookies - as in cooked cookie dough. And it is the best!!!! Before going to the grocery store last week I asked my husband if he wanted me to pick something up for him. "Get me some Ben&Jerry's please." Riiight, but what flavour? "Surprise me." I don't normally eat ice cream - I only very recently started asking him for a couple of bites when he's eating ice cream (Okay so I don't really ask, I just open my mouth and leave it open until he notices and shoves a spoonful of ice cream in it). So I looked at all of the B&J's flavours they had at the store. Then I saw it... Milk&Cookies. Then I read the details of the flavour and thought "OMG why the hell haven't I ever seen him buy this before?" So I bought it for him and when I got home I asked, "have you ever seen this one before?!!!" And he says "Awe crap... Yes, in fact I bought a pint of it while you were away this summer. And I ate the entire pint in one sitting. Then I bought another pint the next night and ate the whole thing again. This is dangerous ice cream." This is absolutely the most delicious ice cream I have ever tasted. It is ice cream heaven. It is the dairy product that has made me buy Lactaids so I can eat more Milk&Cookies ice cream. I am going to write Ben&Jerry's a VERY... very... and I mean *very* angry email if they dare stop making this ice cream. Because now that I've tasted it, I'll never feel the need to taste another kind of ice cream ever again because I don't think there ever could be a better ice cream than this ice cream. Whoa... I need to find some of that! The only new flavor I've tried recently is the Jimmy Fallon one, which I loved, but as soon as I saw these pictures, I realized I might have a new favorite. I used to love Wavy Gravy, but since it's been discontinued, I've had to edit my top five flavors. Feel free to check out my list and let me know what you think! I really did not like the after taste. I won't get another one because it was just so off. This is an utterly amazing flavor. I've pretty much only had baskin robbins chocolate since I was a kid but when I had this I was nearly turned. It's definitely a silver medalist. The ice cream gods were in a good mood when they made this flavor. Well done B&J! Every time I go to the store, I purcahse every one of these....MINE...THEY ARE ALL MINE!!! But lately, I have not found any, so someone must be on to me! I can't believe you guys get sooo many flavours! its so unfair! We get like 5 if we're lucky in the UK and Germany gets even less!